How do you store your weapons? Do you keep them in a cupboard? Do you show them off in a stunning display in the nook at the top of the stairs? Are they lightly nailed to the wooden beam across the dining room ceiling? A charity shop near where my mum lives likes to keep them in a wooden cot or a crib (I’m not entirely sure which one it is) because that’s how they roll. There’s no room for a baby in there, only tools of war. The next time you’re trying to make your friends jealous with the chainsaw you just bought, why not take a leaf out of their book? 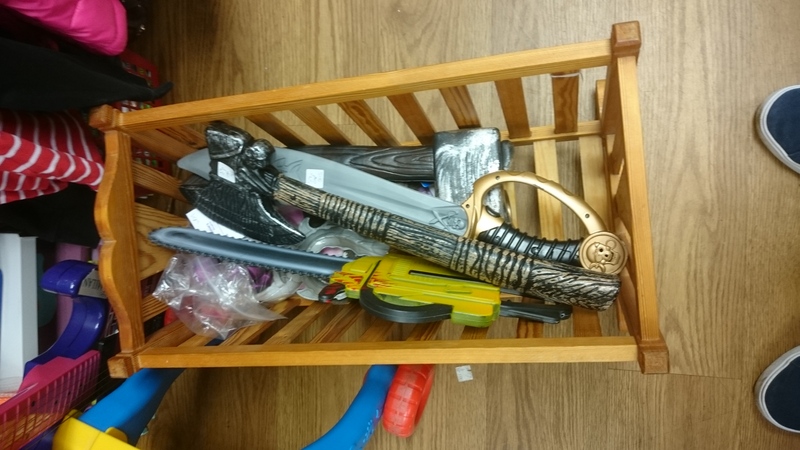 There’s nothing more eye-catching than a cot full of weapons. Soon everyone will be doing it. Make sure you get there first. I thought I was so avant garde. Now I find that everyone’s doing it. When I get home that manger full of machetes is going straight in the bin. You were so ahead of the fashions though, you’ve never been that prepared. Why not try again? Put some Mars Bars in a fish tank? It’s too late for that, I’m already committed to a new project where I’m steadily filling an inflatable paddling pool with javelins. That is gonna work SO well. I would love to know where you get your ideas from. I’m already concocting a meme based around this very premise. I get my ideas from a hole in the pavement just outside my flat that steams gently in cold weather. How inconvent is the hole and how many beds can you purchase from it? This is my overall opinion of Royksopp, where you live. That sounds more like a question than an opinion. It’s both. It’s a qupinion. I like that better than a opestion. I will neither heed nor answer it. Good day to you.